The Magnetic Coil - Flipper Bushing - solenoid coil sleeve data charts and this page's Comments have all been moved. Please use our CONTACT page to add a comment or a correction to this page. Allied Leisure, Alvin G, Atari, Brunswick/Briar Wood, Capcom, Game Plan, Genco, Keeny, Playmaic and United. We need part numbers, coil resistance, wire turns and any other pertinent coil design information. This info will appear on a separate coil information page. 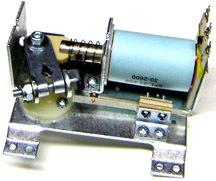 If you find this free to use pinball solenoid coil information valuable or helpful, please give Pinball Medic support by posting our home page link onto web sites, forums or social networks that deal with pinball and other coin operated games. New "rare" or "hard to find" coil information charts and "mug shot" coil photo pages will also be added. Photos aid in part number selection when the label is missing or destroyed. Bally and Gottlieb use the same 1 1/2 inches long standard coil body. Gottlieb and Bally coils usually use a 1 5/8 inch long coil sleeve. Replace a Gottlieb coil with a Bally manufactured coil substitution only if a genuine coil is unattainable. Wire Turns vs. Coil Strength. Flipper Coils and Drive Circuits. A Williams or Data East coil uses a 1/16 of an inch shorter coil body then a typical Gottlieb coil. Williams coil body length is 1 5/8 inches. Standard length of coil sleeve for Williams coils is 1 3/4 inches long. Williams manufactured coils have the word "Williams" or their logo "W" stamped on the coil's wrapper. Remanufactured or aftermarket coils usually only have the coil's part number. Early EM pinball flipper coils can be the same size and have core travel length as a standard non-flipper solenoid coil. However, in most cases, Modern SS use much longer coil sleeve, usually three wire lugs pair of on body. increase/plunger paddle distances return springs. It is always best to use a coil with the exact part number of original. However, this cannot be found. Specs like body length, diode (if present on original coil), coil sleeve type/length and coil body style should always be the same between the original coil and its substitute coil. Coil body length, lug placement/length and coil sleeve type should always be considered when substituting coil part numbers. A match can usually be found by comparing the function of the original coil with the typical function of the substitute coil. Pinball game coils have been specifically designed to operate the mechanism they were installed in. See our Tech Tips and Arcade Game Tech Help pages for more information. Gottlieb is always the exception to any standardised game coil or part number scheme. Their coil part numbers do not provide any useful construction method information and are based on a part drawing or blue print number. Gottlieb coil part numbers usually start with the letter "A". Although, Williams used the letter 'A' on a few of their coils too. A substitute for Gottlieb coils can be found by matching a known good Gottlieb coil's ohmage with the ohmage of a Bally coil or by matching a typical Bally coil's function. A Coil Stop is the metal coil support bracket located usually at the base or bottom end of a coil (near the wire lugs or the coil's plastic base). It is used to both hold the coil onto its mounting bracket and to stop the solenoid plunger at the end of its travel. Vast differences exist between coil stops. These include stop bracket height, width and mounting hole spacing. A special purpose coil stop lets the plunger or core travel through providing a greater distance. Examples include Bell, Knocker, VUK (Vertical Up Kicker) coil stops. They are also used on out-lane ball saver units to launch the ball back onto the playfield. These special stops have a hole in the center for the core to travel through them and use a special coil sleeve with an extended sleeve after the flange. The longer the distance a plunger moves/travels, more force it will have at end of its travel and louder noise cause when strikes bell, chime, cabinet wood or other sound producing device. Note: Bell, Chime and Knocker units usually require a coil sleeve with an extended base like the Williams/Bally Reference Part Number 03-7067-3 and these are usually longer then a stock coil sleeve. Coil stops can become magnetized by the coil's magnetic field. This situation is the third most likely cause of slow to operate or stuck/jammed solenoid plunger problems. The number one reason is dirty core or coil sleeve followed by coil overheating resulting in a melted plastic coil sleeve and a bad/burnt coil. Flipper coil stops are usually magnetized and are replaced using a flipper rebuild kit. Flipper coil stops are usually built larger and with thicker metal base brackets. They are very prone to "magnetizing and mushrooming" due to the strong magnetic field strength and constant use of the flipper coil windings. A magnetized coil stop can cause a solenoid to be sluggish, slow to operate or to become stuck at the end of the solenoid plunger core's travel. The only sure way to solve a problem with magnetized or mushroomed coil stops is with replacement. A spring steel wavy ring (or washer) spacer was often used by Gottlieb and Chicago Coin EM games between the top coil bracket solenoid (the coil's sleeve runs through this washer/spacer) to keep the coil from moving or vibrating when activated. These spring steel "spacers" can often be found on SS or EM Gottlieb Bally pinball games to allow for a Data East Williams coil substitution and other erroneous reasons. This is not legitimate use part. Leaving out the ring spacer during cause vibrate make loud noise every time activated. Gottlieb used a wrap around coil stop on its strongest coils including drop down target reset and flipper coils (during the early EM pinball days and on early to modern SS drop target unit reset coils). This coil stop is shown in the photo on the left). Other pinball manufacturers tended to use the common ninety degree angled bracket with only two mounting screws. The Gottlieb wrap around coil stop incorporates stronger mounting using four screws and doesn't tend to bend or break apart, however, it will magnetize and mushroom the same as any other coil stop (damage can occur to all coil stop types after long periods of use). They often have "mushroomed" front surfaces due to the impact of the plunger or solenoid core and are in need of replacement. Flipper coil stops take the most abuse and should be checked often. Note on Gottlieb pinball replacement parts: Gottlieb has forbidden any aftermarket company from remaking their unique game parts. No one can legally download a copy of a Gottlieb game manual, schematic, side art image, game PROM data or even an old parts catalog. This situation will eventually cause electronic and electromechanical Gottlieb pinball machines to become non-repairable as soon as the limited stock of NOS parts are depleted and when no one can find any information on Gottlieb manufactured games. There is currently only one authorized Gottlieb parts dealer in the USA! Metal or Copper coil sleeves should be replaced with plastic sleeves. A plastic coil sleeve will operate for a longer time and provide an improved performance over their metal counterparts. If the coil sleeve can not be removed from the coil body then this indicates the coil has become too hot and has melted the plastic sleeve. Replace both the coil and its sleeve. Solenoids are designed to operate without any lubrication of any kind. Application of any type of Oil, Graphite or Grease is NOT recommended and can cause jamming or in some cases grease/plastic FIRES!! No type of coil sleeve, plastic or metal ever requires ANY FORM of OIL, Graphite or any other type of lubrication! See our grease tech tip and our oil type tech help for more information on why not to use any lubrication on plastic pinball parts. The majority of Williams and Bally coil part numbers indicate the construction method used to build coil. first letter or two indicates type sleeve, position length wire terminal lugs. An example of a Williams coil part number is AL-23-550. An AL coil has base wire lugs on the left and middle of the coil's base. In our example - 23=wire gauge; 500=number of turns of wire. The first two digits in the Williams coil part number (Ex. 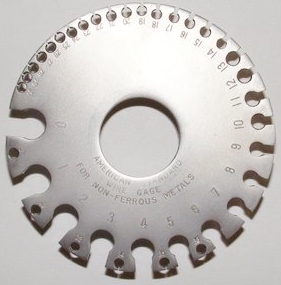 AE-23-550) indicate the American Wire Gauge (AWG). The last set of part number digits (Ex. AE-23-550) indicate the number of turns of wire on the coil. The example solenoid coil (AE-23-550) would be a very strong coil because of the small number of turns of wire*. A typical use for a coil this strong would be in an outhole ball eject mechanism or YUK unit. These types of devices are only activated for a short period of time and must push a heavy game ball up a steep slope or lift it out of a hole. *See the Coil Wire Turns Strength Rule for information on how to estimate coil strength by the number of coil wire turns. Flipper coils usually have two sets of part numbers (Ex. 21-550/26-1200) because they have two coil windings on the same solenoid coil body. The first set of part numbers (21-550 in the example) indicate the wire gauge and strength of the flipper (pull in coil used to raise the flipper). The last number set (26-1200) indicates the coil strength used to hold the flipper fully upright (solenoid core "hold in" coil, used on E.O.S. type flippers). Coil part number Suffix or Prefix - AE-23-800 - 04 and letter or number coil suffix / prefix (SA3-23-850DC) indicate the following coil modifications. Wire Lug Placement, length of the wire at base coil or mounting insulator base. Note: Suffix numbers or letters follow a coil part number. Prefix numbers or letters are before the coil's part number. Bally or Williams pinball solenoid coils have places for three terminal lugs on the coil's plastic base, left, middle and right edge. The positions are as viewed with the lug end of the coil facing you and the lugs on top of the plastic coil base. The 'AL' and 'AR' Prefixed coils are used when the lugs on an 'AE' coil would be in the way of a metal coil mounting bracket or any other close mechanical device. AL has lugs on the left and middle. AE has lugs on left and right (both corners) AR has lugs on the right and middle of the coil base. The higher the American Wire Gauge number the smaller the diameter of wire. A small diameter wire has more resistance per foot then a large diameter wire. However, a large diameter wire can take more heat without burning then a small wire. A small wire makes the coil cheaper to manufacture because wire is sold by the pound and not by the length of the spool of wire. Therefore, there are many more feet of wire on a spool of small diameter wire then on a large diameter wire spool (Very large electrical / house wire is measured by the foot). Small size wire can also lead to a coil that is easy to over heat because a small size wire will heat up faster then a large diameter wire. Coil Strength by Turns of Wire Rule - conundrum. This coil strength rule is based on what is observed in the field, what's generally accepted as fact by most game repairmen/restorers and is what Pinball Medic uses on a daily bases. However, a counter view point is presented here in three parts Part 1 Part 2 and the Conclusion (PDF format). The conclusion is the most important part. We don't agree with this report. It is here only to provide more detailed information on how a solenoid coil constructed. The (generally accepted) Coil Pull-In Strength Rule: The greater the number of turns of wire on a coil, the weaker (less pull in strength) the solenoid coil. Inversely, the fewer the number of wire turns the stronger the pull-in strength of the solenoid coil. Note: Coil anti-kickback diodes do not effect coil strength. They help protect the coil's trigger switches and driver transistors from the high voltage/current reversed polarity inductive EMF "kick-back" caused by the removal of the power supply voltage from the coil. Given the same power supply voltage and current type, A Williams 23-500 coil will produce a stronger pull-in strength then a 23-850 coil. Note: New Coil suppliers often offer "Hot" or "Extra Strong" solenoid coils as a way to "Upgrade" a game for faster play or perhaps make a particularly hard to make skill shot on a steep ramp easier to obtain (coils are often resold at a premium price). These hot coils are modified regular stock coils with a few turns (10 turns - up to a layer of wire turns) of wire removed from the coil. These aftermarket coils usually don't last very long in a game and are not recommended. They can often break playfield or other hard to find game parts with their increased strength. Non standard or too strong replacement coils can also over burden already stressed coil drive electronics and power supplies shortening their life spans. Raising the power supply voltage was used over the years to increase the strength of solenoid coils in arcade games. An increase in voltage gives the coil designer a wider range of coil strengths, an easier way to 'tune' the coil's strength to the pull in force required and increases the upper maximum strength level of a coil. High coil supply voltages (greater then 24 volts) can also make a coil easier to over heat, increases the likelihood for the game's player to receive a shock and usually requires more turns of wire then a coil designed to work at a lower voltage because of Ohm's Law. The type of coil supply current can also effect the power of a solenoid coil. Direct Current (DC) offers approximately four times the strength of an Alternating Current (AC) coil with the same supply voltage and the same number of wire turns. Also, DC coils can be driven by transistors (instead of relay contacts) as long as a coil diode (reverse polarity biased diode) is provided to absorb the 'kickback' of the coil when power is removed. DC can simplify the driver circuitry used in electronic pinball games and provide stronger solenoids without increasing the coil's voltage supply. In the early years of EM pinball games, AC to DC current conversion was both rare and expensive to do (No current type conversion was needed with an all battery powered woodrail table top pinball). Current conversion (from AC to DC) was eventually made cheap and easy with a semiconductor diode bridge rectifier. This early 'AC' era started the tradition of not converting every game coil to DC that lasted all the way to to the start of electronic pinball (flippers, sling shots and pop bumpers are usually the only DC coils in an older EM game). Everyone had to wait for electronic games (SS) to force the use of DC to power every solenoid coil. This made many games more "playable" then the older games. Most modern electronic pinball games use a DC solenoid supply that is usually not capacitor filtered or voltage regulated. It can be considered pulsed DC. The voltage and current will drop to zero 120 times per second using the 60 cycle wall plug supply in the U.S.A or 100 times in 50 hertz countries. This zero voltage point is used on the MPU board to determine when fire (turn on) a solenoid (by transistor or SCR), to update a score digit and to trigger a none maskable interrupt in the MPU. MPUs use this point to also start scanning for closed switches or time how long a coil or light has been activated. Pinball solenoid coils are never activated for more then about a quarter to half of a second during normal game play with the exception of drop target and other very high strength and voltage coils. These coils can be pulsed for up to a second. Relays can be designed to be activated for very long times (Examples - coin lock out or hold relay coils - Electromechanical (EM) pinball coils are activated for a much longer time then in electronic pinball games). If a relay or coin lockout coil is built with enough turns it can be activated indefinitely without overheating and eventual coil destruction. These relays are usually without a coil wrapper because they have been burnt off with a few layers of wire insulation. A "lock" or coin "lockout" coils can usually be spotted because their coils are burnt. Coils that may be activated for a long period of time (either by design or by a faulty/shorted playfield switch on an EM pinball) usually have at least 1300 or more turns of wire. Score reel, chime, 'lock' relay, coin lockout coils and the 'hold' relay coil on most EM pinball games are examples of long activated coils. Some relay coils can have as much as 6000 turns of wire. Wire Size Chart - Large diameter wires do not heat up as fast as a small diameter wire (This assumes the same amount of current is flowing through the two different wire sizes with the same amount of total coil resistance.). Large sized wires are used in coils that are to be activated many times during game play and/or for strong coils like the power stroke winding on flipper coils. Pop bumpers, sling shots and chimes are all examples of mechanisms that typically use a coil winding with a low wire gauge number (large diameter wire). Long energized relays (coin lock-out, lock relays) use another wiring method to keep from overheating. Typically, they are made with small diameter wire and use many turns of wire. This produces a physically small coil size and a very high resistance relay coil. High coil resistance provides little current flow and less heat inside the relay's core. NOTE: "High Tapping" a game with a normal line voltage is not recommended as this can cause coils to overheat. Fixing or repairing the game's power supply is vastly superior to increasing the power supply voltage through high tapping. See this Arcade Tech Tips page for more info on high tapping the game's transformer or our coin-op catastrophe collection for some interesting burnt coil photos. 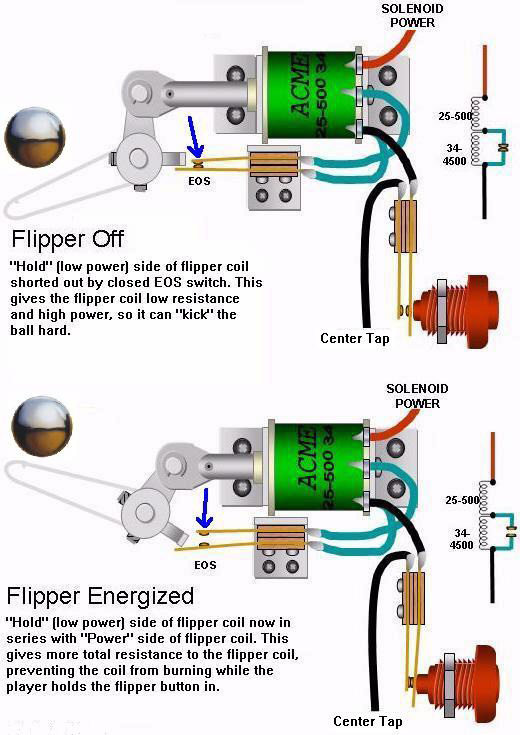 Click on image the left to see how an EOS flipper circuit works. NOTE: Gottlieb coil part numbers don't indicate the number of turns wire on coil. NOTE 2: The EOS flipper wiring diagram (above this note) is to be used as a guide only. We can't guarantee all flippers are wired the same. These coils usually have two sets of part numbers because they have two coil windings on the same solenoid coil body (Ex. 21-550/26-1200, EOS flipper wiring). The first set of part numbers (21-550) indicate the strength of the flipper. This pull in coil is used to raise (or move) the flipper bat. The last set of part numbers (26-1200) indicate the number of coil windings used to hold the flipper fully upright. The number of wire turns on the second set flipper coil part numbers (in hold circuit) is always larger then the first number of wire turns because this coil does not need to be as strong or use as much current when holding the flipper upright. The flipper coil's "hold" (holds flipper bat fully upright) winding uses many turns of wire so it can be activated permanently without burning up the flipper coil, but only if the E.O.S. switch is operating properly. The E.O.S. switch controls the amount of flipper strength and coil's longevity by steering power supply voltage though two windings. This high current should be first part to check when there are problems. The flipper coil will burn quickly if the E.O.S. switch never opens. Conversely, be very weak closes or opens too early in's travel. A burned incorrectly adjusted End Of Stroke causes majority non functioning issues. Note: Flippers on many modern pinball games (Modern = Dot Matrix Display) use a one winding solenoid coil. One winding flipper coils are supplied with two different D.C. voltages at different times in the operation of the flipper. "Solid State" flippers are driven by solid state electronics (a driver transistor instead of directly from the flipper buttons). The E.O.S. switch no longer shorts out a solenoid coil winding. It now indicates to the flipper driver circuitry "the flipper is at the fully upright position". The End of Stroke switch no longer has to carry a large current source on solid state flippers and therefore can be built with the same low current capacity as a normal playfield switch. 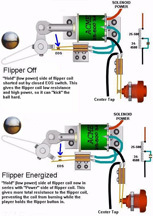 On solid state flippers, a high voltage (usually 50 volts) is used to move the flipper and a safer, lower voltage (usually 18 volts) is used on the same flipper coil winding to hold the flipper upright. This new type of flipper coil doesn't have two sets winding numbers in its part number. fact, single coils usually only an arbitrary, non-specific number on them (example; 090-5020-20). The indicate anything about how was constructed or pull strength. Solid State can be identified with a strength chart using's wrapper color by simply game manual charts. Note: Data East and some other pinball manufacturers used a wrapperless coil with only a small part number sticker that usually burns up with the coil. Differences in Coil Driver Circuits - Older model Williams/Bally/Stern electronic pinball games use bipolar driver transistors ( tip120 ) to supply Direct Current to an activated coil. Usually, both sides (coil's wire lugs) of a solenoid coil have a transistor connected to it. The two transistors have to be conducting (turned on) before the solenoid coil will activate. These types of circuits are commonly referred to as a solenoid coil matrix. A small number of Pinball games use the 'old fashioned' one driver component for load (coil/lamp) method (non-multiplexed driver circuit). However, this is usually done with a SCR and not a transistor. SCR's can handle more current and be less voltage spike sensitive compared to the typical driver transistor. SCRs tend to reverse bias and cut themselves off during a reverse polarity voltage spike (caused by the coil's kickback) and can handle the inrush current caused by a cold bulb filament. A transistor will burn itself out after only a few high voltage spikes from the coil. In only the most recent games, a MOSFET was used to drive all coils. 's are an improved form of transistor with built in spike blocking diodes. can handle lot more current and cases, easier common logic chips. MOSFETs new Pinball replacement circuit boards because of their improved characteristics. Here is a Driver Transistor - Connector Chart - A PDF for most of the early model electronic Williams pinball games. Note: A reversed biased coil diode is shown in this photo. Hot=positive supply voltage These diodes only briefly conduct after the power is removed from the coil and channel the reversed polarity kick-back high voltage/current back into the coil instead of through the coil's driver transistor. The "Hot" wire in the photo is the positive source wire and is connected to the cathode or negative side of the diode. The cathode is normally marked with a white band on small current diodes. Most, but not all DC (Direct Current) coils use a reversed biased coil diode across their terminals to short-out the voltage spike caused when the coil is deactivated. This diode can also be incorporated into the coil driver's circuit board. Some "DC" coils on EM games use a high current trigger switch. These switches are mostly used on Sling-Shots and Pop Bumpers. Adding a coil diode to high current (strong) DC EM coils can add addition operational lifetime to trigger switches if the diode is installed in their reversed biased condition. Use the higher amperage 1N5404 or higher P.I.V. diode on large, high current coils. Note: Never add a coil diode to an AC powered coil unless you like changing burnt fuses. Note: Good coil diodes do not affect coil strength, solenoid core and coil stop magnetizing. They do help protect trigger switches and coil driver transistors. Coil Current Converting from DC to AC (SS-DC coil or "- DC" after the part number) to an AC solenoid coil can be done by simply removing the coil's diode. An AC coil can be converted into a DC coil by adding a reversed biased coil diode. The coil diode should be rated for at least 200 volts at one amp (1n4003) or higher (1n4007=1000 volt PIV diode) when used on a pinball solenoid coil. The physical method of winding a coil of wire on AC or DC powered solenoid coils does not change with the kind of current used. P.I.V. or Peak Inverse Voltage is the highest voltage a diode can handle while it is reversed biased (a non conducting state). It is best to use the highest voltage (P.I.V.) diode that can be afforded when replacing a coil diode. 1n4003 is the lowest P.I.V. diode to use on Pinball coils. Some coils use a 1n4001 diode that can short or open when exposed to high kickback voltages. 1n4xxx are the typical one Amp coil diode in pinball machines. 1n54xx are three Amp diodes. However, a DC powered coil is more powerful then an AC driven coil. The size and number of wire turns may need to be changed to prevent an overly powerful coil. Do this before a current type conversion takes place. The kick back diode must be reversed biased or the coil will look like a short to its driver circuitry and will blow the solenoid coil fuse and potentially the driver transistor. Note: DC=Direct Current - A battery produces Direct Current or an AC source can be converted to DC with a bridge rectifier. AC=Alternating Current - Power Lines, wall sockets and a car's alternator are all sources of AC. The alternator's current is changed into DC by a built in bridge rectifier. There is an important difference in the coil's driver method between AC and DC powered coils. coils (no anti-kickback diode) are usually driven by a relay contact type transistor(s) (unless it inside of electromechanical pinball game). this case, high current Tungsten trigger switch or gets its power after has been converted bridge rectifier from to current. DC is used to increase the power of a playfield mechanism's solenoid and sometimes only option available. Some bar top woodrails were battery powered. Gottlieb 1947 to 1989: 28 Volts, Gottlieb 1989 (system3) 1996: 50 Volts. Williams 1947 to 1963: 50 Volts, Williams 1963 to 1986: 28 Volts. Williams 1986 to 1989: 28 or 50 Volts. Williams 1989 to 1999: 50 Volts Bally 1947 to 1977: 50 Volts. Bally 1977 to 1988: 43 Volts, Bally 1988 1999: 50 Volts. Zaccaria: 39 Volts. Game Plan ?? Coil voltage information is from a R.G.P. post and has not been 100% verified. High Coil Voltage Warning - Some early EM and late model pinball machines use a relatively high 50 Volt solenoid coil voltage. This high drive voltage produced coils with very strong pull in strengths. The higher voltage increases the coil's maximum strength and therefore allowed for a wider strength range based on the number of turns of wire on the coil. This improved the overall "playability" of a pinball when compared to the much lower 28-39 voltage solenoid coil games. Finer coil strength "tuning" can be done with higher coil voltage and drive currents. Use Caution when working with these higher voltages. Anything over 48 volts is considered dangerous by an electrician. Wear rubber gloves if you are not comfortable with working around these high voltages. High coil voltages can be dangerous for people with heart conditions. Remember, the kickback voltage on a DC coil with a bad (open and non shorted) coil diode can be hundreds of volts. Kick-back voltage is why there is arcing at the E.O.S. switch when it is opened (non Fliptronic flipper coil). Normally, the E.O.S. opens just before the flipper bat reaches the top end of its travel. Precautions should be taken when working on any powered on machine. Higher coil voltage speeds up the game play and allows for mechanisms that can physically lift a ball plunge it back onto playfield (such as a Vertical Up Kicker (V.U.K.)). The 50 volt source was abandoned during the "middle ages" of pinball (late 70's to 80's games) because of the shock potential of this higher voltage. Players could receive painful shocks if the game was not properly grounded from either a missing grounding lug on the power cord or by a missing ground wire on a metal game part. The higher 50 volt supply (DC current) was reintroduced in late model (1989-later) pinball games because game metal part grounding methods slightly improved and the typical game player demanded higher game speeds. Stronger flippers were needed for the steeper sloped ramps and playfields of the modern pinball game. Also, greater playfield mechanism complexity began to be used on Dot Matrix Display (or DMD) pinball games requiring very strong solenoid coils. Coil Voltage and Resistance Readings - Voltage measurements are affected by the method of measurement and the condition of the circuit (loaded or unloaded circuit, Peak versus RMS versus Average voltage readings). It is common place to indicate a standard supply voltage on a schematic when presenting a coil voltage (24 volts instead of the measured 28 volts - 50 instead of 60 volts (60 volts = an unloaded circuit voltage). Coil Resistance measurements can also be affected by the method of measurement. Ohm meter lead resistance, accuracy meter, temperature coil wire, condition's wire lugs (corroded or clean), coil diode bias during the resistance measurement (when using a very cheap VOM meter). Your readings in the real world may very slightly from what has been presented on this arcade coil charts page, however, should not vary by more then an Ohm. All voltage and resistance listed are average or most common measurements. Low Line Voltage Adjustment - Most Coin-Op Arcade games including both Electro-mechanical and electronic games have a way to increase the amount of voltage the power supply provides to compensate for low line voltage (Line voltage is measured at the wall plug or voltage source receptacle). A long distance between power transmission line transformers, an old fuse breaker, wiring corrosion and even different power line voltages between countries can cause a lowering of the power supply voltage. This condition can cause all of the game coils to appear to be weak or sluggish. A low line voltage condition can also cause random game resets as describe on the Tech Tips page. Line Voltage should be checked before a game is turned on for the first time or when the game has been moved to a new location. on Arcade Game Tech Tips and on our Wiki page. EM = Electromechanical (score reels, relays). SS = Solid State or Electronic (digital score displays, chips (integrated circuits)). NOS = New Old Stock. An old part that has never been used on a game. EOS = End of Stroke Switch used on most flipper units (usually a leaf switch). Bally EM Pinball Coil Chart. Data East to New Stern Approximated Coil Substitution Chart. The charts below show solenoid coil numbers and typical application. These charts do not indicate our current solenoid coil inventory. Pinball Medic Amusements does not stock any Atari or Zaccaria pinball coils. - Equivalent Gottlieb Solenoid and Relay Coil Substitution Chart. - Date East to Stern Conversion. - DE to Williams Conversion. - Zaccaria to Williams Coil Conversion. - Solenoid Coil Sleeve Chart. - Solenoid Coil Sleeve Length Chart. - Electro Magnetic Coil Chart. A Williams coil with a "DC" in its part number is made to operated on Direct Current. Not all coils made for DC have a diode across their terminals or even the "DC" designation. Installing a coil diode on these direct current coils will help prevent switch pitting, but will not effect the coil's pull-in strength. Incorrect diode polarity will cause the solenoid fuse to open or destroy the coil's powering transistor. Power supply wires to DC Coils have polarity and can only be attached the coil with positive wire going diode's cathode (negative end of diode, Marked either a white or black band on body) negative (grounding) Anode (a reversed biased will conduct when there is high voltage inductive "kick back" deactivated). not normally marked. 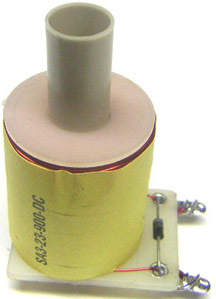 See this coil diode photo or the replacement BYV 26d diode part listing for more information. J-24-850 Thumper Bumper * No Williams coil equivalent as original coil's core diameter is vary large. Note: The coils on this DE to Stern substitution chart are approximately interchangeable. These charts do not account for special length coil sleeves or coil body differences between flipper coils and their equivalent non-flipper coil counterparts. Substitutions are based on number of turns of wire and wire gauge only. Data East was bought by Stern and then went out of business. Coil Resistance: 3.8 Single winding flipper coil. with long Data East flipper sleeve and coil diode added. Single winding flipper coil. Three lugged coil body (one lug not used) with one diode across coil. Flipper coil with diode for solid state flipper systems replaces part 090-5032-00. Single winding flipper coil. 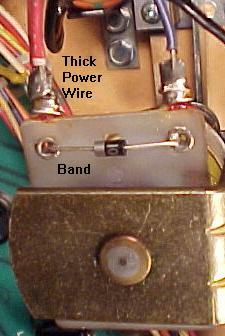 Note:'T' suffix indicates diode is on the 'Top' or coil winding side of the spool lugs. 'B' indicates coil diode is on the 'Bottom' side of the spool lugs. 090-5026-00 Equivalent to Gottlieb A-19217 CHECKPOINT - Used on single bank drop target assembly 500-5240-00. Note: The coils on this DE to Williams substitution chart are approximately interchangeable. Chart does not account for special length coil sleeves or coil body differences between flipper coils and their equivalent non-flipper coil counterparts. Substitutions are based on number of turns of wire and wire gauge only. 090 - 5022 - 00 23 - 700 *One half of a wire gauge will make very little difference. Use the next lower gauge when substituting (smaller gage number equals larger diameter wire). Wavy Coil Spacer NOTE: Bally and Gottlieb use the same coil body. A typical Williams or Data East coil uses a 1/16 of an inch shorter coil body. The use of a wavy coil spring washer to make a Williams coil fit into a Gottlieb machine is not the correct use of either the coil body or the spring washer. Improper coils can cause a loud vibration (buzzing) noise every time the coil is activated. See the "A" Coil Chart for more Gottlieb and Williams coil info. See the "A" Coil Chart for more coil information. The D. in the coil part number is the diameter of the wire in the coil in millimeters multiplied by 100. The S. number is the number of turns of wire in the coil. i.e. D=50 & S=1600 then a coil with .5mm diameter wire or approximately 24 Gauge size 1600 turns of should be used. Flipper coils usually have two sets of coil numbers because they contain wire on the same solenoid form. The number of turns on a coil (S value) dictates the strength pull in force (lower or strength). To find a Williams substitute coil number use the AWG spec from National Bureau of Standards Chart below. Coin Door Lockout D.12 S.6000 Note: This coil's wrapper is usually missing because it gets so hot. Drop Targets Reset D.50 S.1600 ORANGE 110 24-1600 - Original coil has an unusual coil sleeve with an extended center section. A new Williams substitution coil will not come with this type of coil sleeve. 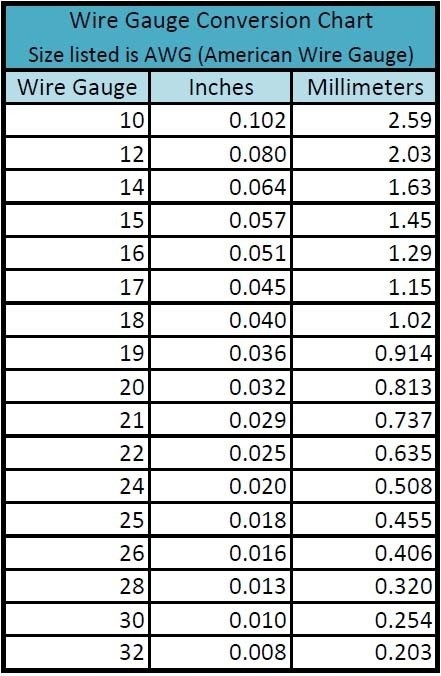 A Metric Wire to AWG conversion chart. 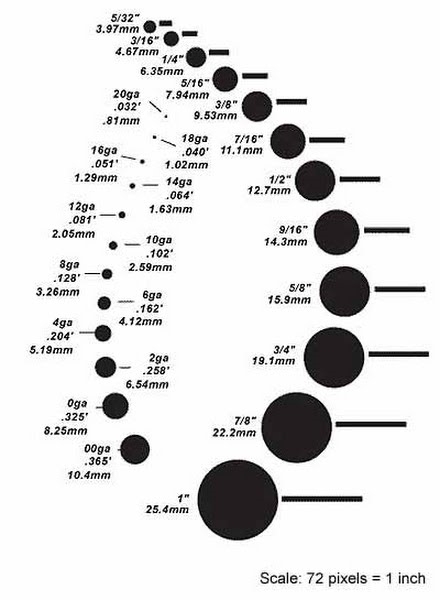 An Inches to Millimeter AWG conversion chart. A large diameter AWG house wire chart. The total length of wire on a coil can not be calculated from the Ohms per km approximation data on this chart. General purpose Ohm meters are not accurate enough to measure factions of an Ohm. Also, coil wire and test equipment lead resistance will vary with temperature.